This post will take a look at the most recent innovations in mobile payments around the world, getting you right back up to speed. We recommend adopting Apple Pay and Google Wallet for most retailers. This was the amount spent on mobile last Christmas in the UK - a figure nothing short of staggering. Mobile shopping accounted for 27% of online sales and reached an all-time high of 34% of online traffic*. Buying stuff from the palm of your hand is now not just a growing trend, but a key focus for your digital strategy. Recent year-end statistics by analytics firm Flurry reinforced this from a different perspective. The ‘Shopping’ category on the App / Play Stores saw the biggest growth of all sectors, expanding by 174% on iOS and Android. Despite all these incredible stats, let’s turn our attention to the players who’ll be enabling the next wave of mobile payment growth. The simplest NFC solution, albeit with limited share of the global market, accounts for 41% of the phablet US market at present. It all started with the launch of iPhone 5s and its thumb-reading Touch ID technology. This allowed users to unlock their device and verify App Store downloads in a secure, effortless way. It made sense to extend this effortless security method far beyond Apple’s own domain. 2014 saw the US release of Apple’s Apple Pay service. This allows newer devices (iPhone 6, 6 Plus and newer iPads) to make payments both for digital and physical retail transactions. 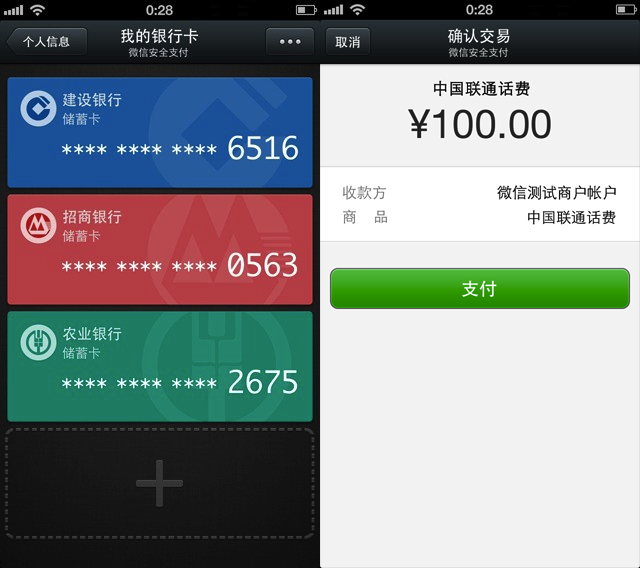 The only app needed to make the payment is Passbook, which is preinstalled on iOS. The payment experience is familiar to iPhone users. 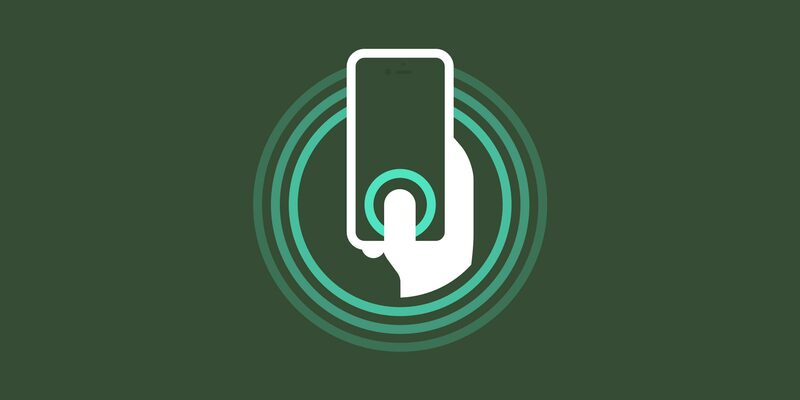 To pay in store, users hold up their phone to an NFC (Near-Field Communication) reader and place their fingerprint on their phone’s Touch ID sensor. To pay online, customers just tap the Apple Pay option and scan their fingerprint in the same way. Apple claim that this is quicker and safer than conventional credit card payments. Apple Pay doesn’t store and track purchase details, which means it can’t offer customised deals, but does benefit from greater privacy. In October, CEO Tim Cook announced that more than 1 million credit & debit cards were hooked up to Apple Pay within three days of launch. Subway, McDonalds, Walgreens, Uber and 220,000 other vendors have already signed up to receive Apple Pay. US grocery store Whole Foods trialled Apple Pay and it already appears to have benefited from the new mobile wallet. Cook said that Whole Foods experienced more than a 400% increase in contactless payments as a result. Since Mid-January, 2% of store sales are now coming through via Apple Pay. It’s currently only available in the United States, though will roll out globally in 2015. An NFC-based system which works with all NFC-enabled Android devices and iPhone 6 and 6 Plus. Accepts pretty much any credit and debit card. Access to 300,000 merchants at present, but remains US-only for now. For over 3 years before Apple Pay was released, several Android phones had already offered the ability to pay by mobile in the US, themselves equipped with NFC technology. Google Wallet works in a similar fashion to Apple Pay; an NFC till is required, and the phone is held up to it to make the payment. The difference for Google Wallet lies in the request for a PIN number to verify each transaction. For convenience, this can be turned off by the customer. But one wonders if security is somewhat compromised due to a sub-optimal user experience, especially in relation to its main rival. Since it launched, Google Wallet has been rather slow to take off, overtaken by telco-funded payment provider SoftCard. Given the fact that its operating system is open-source, and therefore has less control of the device, it’s got a less defined mobile payment strategy than Apple. However, Google and Softcard announced a deal in late February that would mean Google Wallet would be preinstalled on Verizon Wireless, AT&T and T-Mobile USA devices. 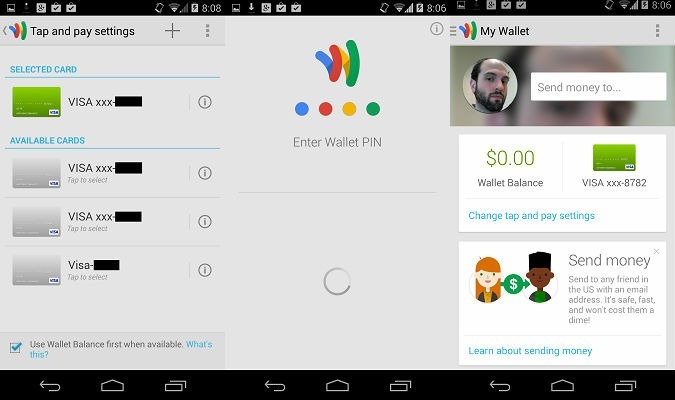 This will make it much easier for users to get started with Google Wallet. Also, recent rumours suggest that other mobile payment providers have received a boost following the launch of Apple Pay. For instance, Google Wallet has had considerable growth in the last couple of months following the unveiling. And with Google’s Android operating system having an estimated 80% of the global mobile phone market, one can be sure that Google Wallet will ride the coat-tails of Apple Pay for as long as it takes to make this new payment method an everyday expected behaviour. Cross-platform app offering some innovative features but needs an internet connection and doesn’t offer NFC. Paypal processed $46 billion in mobile payments in 2014, according to the company, and it accounted for 78 percent of all digital payment dollars in November, according to research by Investment Technology Group. The term “digital payment dollars” refers to dollars spent using all online payment methods. 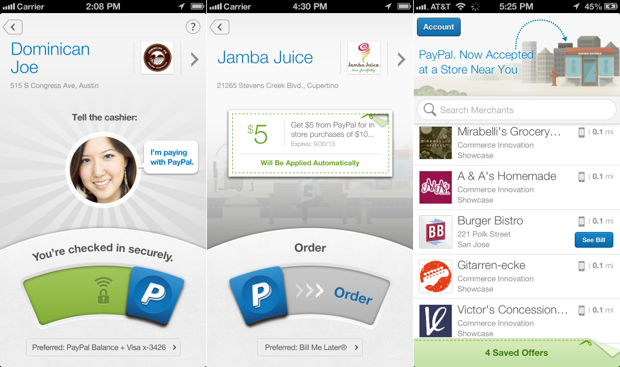 Paypal’s current payments app is positioned a little differently to its competition. As well as businesses, it can also be used to pay friends, so offers a more holistic take on mobile payments than some of the other technologies listed here. It offers a variety of differentiating features: Local Paypal-friendly shop search, Order ahead, ‘Bill Me Later’ (where the customers can opt to eat now, and pay at a later date), and Beacon technology, allowing for smarter, targeted in-store experiences. Though not as slick as Apple Pay’s Touch ID tech, Paypal have also recently smoothed the payment experience by launching One-Touch, where shoppers can pay with a single swipe. 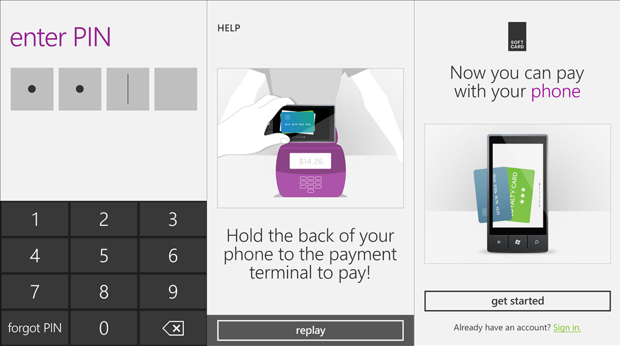 It’s still not as frictionless as Apple Pay though. Also, with Paypal, retailers would have a lot lower upfront costs to stomach than Apple Pay, Softcard and Google Wallet, where significant upgrades must take place to the existing POS and processing infrastructure. However, some of the pitfalls in choosing to go with Paypal are that both the retailer and the customer must have access to Paypal’s software, that the experience from within the Paypal app can’t be customised to fit the uniqueness of the brand experience, that different retailers require different methods of completing payment, and that an internet connection is required for payment. Nevertheless, Paypal is currently used in 8000 UK shops / restaurants, has access to 19m and 150m active UK and Global accounts respectively, so can’t really be ignored. 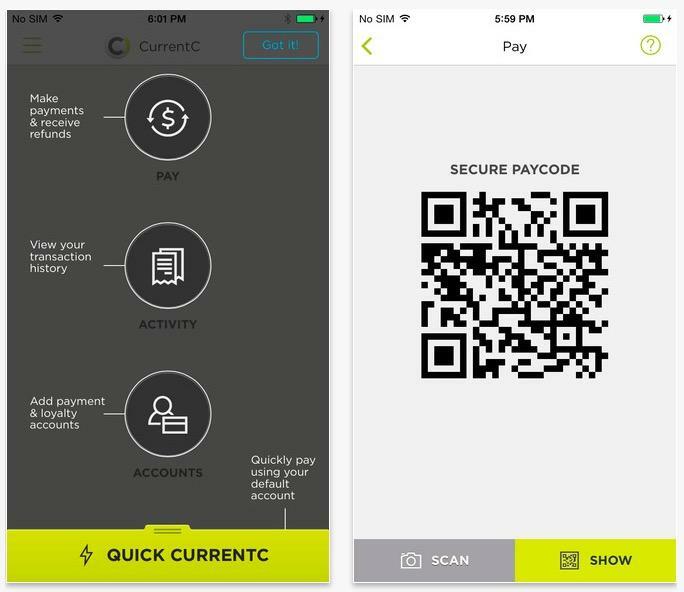 Perhaps seen as the ugly duckling of the mobile payments space, CurrentC is an app and POS solution that aims to remove the credit and debit card transaction and fees altogether, saving roughly 1.5% of the transaction cost. Created a by a mega-consortium of US retailers, a rather cumbersome QR code experience lies at the heart of CurrentC. It’s been limited to QR codes because Apple has locked out other payment providers from using the iPhone’s secure element necessary for secure transactions, and this is the only method on iPhone and Android that bypasses the credit card tax. It is promoting itself as not just a payment method, but also a means to digitise customers’ existing physical barcode keyfobs and lure them in with rewards, coupons and holiday discounts. Shortly after CurrentC’s unveiling, Best Buy and Walmart (two of its protagonists) explicitly stated that they would not accept Apple Pay, while CVS Pharmacy and Rite-Aid silently disabled all NFC payment systems in late October 2014. We believe that this method of blocking what will become a commonplace and expected method of payment is a foolish and short-term decision, and one customers won’t appreciate, especially when the experience is inferior to that experienced in competing stores. People have and will continue to vote with their feet, if the attraction of its loyalty toolkit isn’t strong enough, and the habitual experience is too jarring. A US NFC-based system, similar to Apple Pay and Google Wallet. It was developed by a leading group of telecoms companies: Verizon, AT&T and T-Mobile, and has access to 200,000 merchants at present. Its apps are available on Android and Windows Phone devices though, alas, not on iOS. And as a customer, you’ve got to be on one of the networks that created the system. Furthermore, some networks are also blocking alternative payment systems from their smartphones so they’ll not compete with their own Softcard wallets. Yet another frustration is that it only works with a small handful of cards at present, though Softcard does say that they are adding more soon. Both Softcard and Google Wallet suffer from an inferior customer experience in relation to Apple Pay, requiring the cumbersome entry of a PIN code for each transaction, next to Apple’s effortless Touch ID verification. It remains to be seen how successful Softcard will be at grabbing a slice of the mobile payments pie, especially if the companies supporting it fall foul of their competing agendas. Despite the fact that it announced a tie-in with McDonalds back in November, there are some concerns that the $15m it’s burning through each month and that it recently let go of around 20% of its team imply a difficult time ahead. Despite estimating to have 468 million active users in Q3 2014 and to be the second largest global messaging service after WhatsApp, which had 700 million active users (Jan 2015), you might wonder why we’ve included a Chinese mobile messaging service in our list. WeChat is not just a messaging platform, however. It’s now leading the world in terms of monetising its popularity by creating innovative new services and business models, challenging the Alibaba Group in m-commerce and online payments in China. According to The Economist, WeChat is expected to generate revenues of US$1.1 billion in 2014 and to record growth of 40% in 2015, and the company is heavily focusing on increasing its revenues from mobile commerce and payments. We’ll look at a few of the WeChat success stories in a separate post, but one could argue that what WeChat is achieving in the Chinese mobile payments space is more disruptive than anything currently seen in the West. Watch this space. There are also several other providers and players in the mobile payments market, each using different methods of payment. This includes mobile P2P transfer like Barclays Pingit, payment systems like JudoPay that you can bundle into your existing app (as we’ve done with our award-winning payment and loyalty app for Harris + Hoole) and payment via banking apps like Zapp. There’s also the added complexity of brands own existing apps. A great example here is the Starbucks app which, due to its account top-up process, is the most successful mobile payments app out there. It has 13m US mobile users, processes 7m mobile transactions each week, and accounts for 90% of the $1.6bn of mobile payments transactions. Currently, Starbucks is able to track consumer purchases and gather vital data on personal spending habits. The app’s recently been updated to include digital-only support for Apple Pay, where balance top-ups can be made on the phone using the new payment method. But the next challenge for Starbucks lies in how the in-store Apple Pay NFC terminal will work alongside this incredibly successful app. 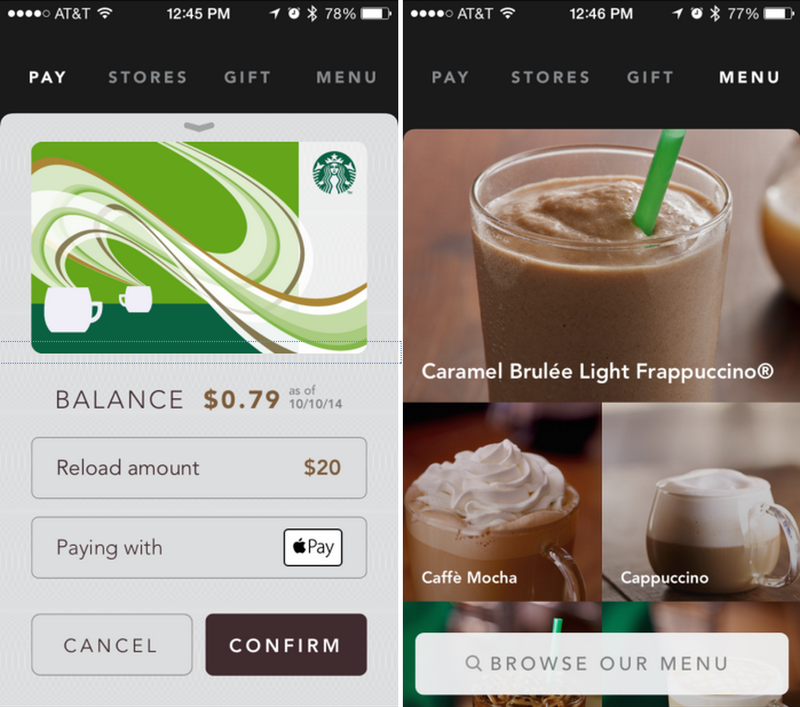 Starbucks hasn’t announced any plans to implement Apple Pay in-store. But imagine for one moment that they had… If customers choose to use the Apple Pay terminal to buy their coffee, Starbucks will lose vital customer data, given that Apple Pay purposely doesn’t track transaction details. This isn’t currently a problem with the Starbucks app, where the in-app Apple Pay top-up transaction and the order of a decaf flat white are separate and user-trackable via Starbucks’ CRM. This is the same for the award-winning app we built for Harris + Hoole in the UK. The big question remains to be how Starbucks’ highly popular and strategically-critical loyalty and payments app won’t be hurt by the expected adoption of Apple Pay in-store. Customers will be faced with a choice between effortlessness (new behaviour; NFC at the till) and loyal reward (an existing behaviour; mobile account top-up). Starbucks CEO Howard Schwartz currently sees Starbucks and Apple as “frenemies”, with each benefitting from the partnership at the present time. But Starbucks won’t want to let go of the loyalty data capture, and Apple Pay’s anonymised transaction policy simply doesn’t offer this. The bottom line is that for any brands with existing apps that focus on loyalty, top-ups or any kind of CRM behaviour or preference capture, there will be a conflict between the gold dust they’re currently gathering, and what a shift to an anonymised mobile payment method will do to this. This focus on loyalty and data capture may be just the thing for the likes of Google Wallet, Paypal or Softcard to persuade retailers to adopt their in-store technology instead. What’s clear from the above list - and we’ve really just covered some of the key players and most interesting stories at the moment - is that there really is a great deal of fragmentation in the mobile payments space. But what’s clear is that there’s a dramatic flurry of innovation and choice on offer for retailers and consumers. NFC is a behaviour that customers already understand and adopt with their existing contactless credit and debit cards. We also suggest accepting both Apple Pay and Google Wallet. 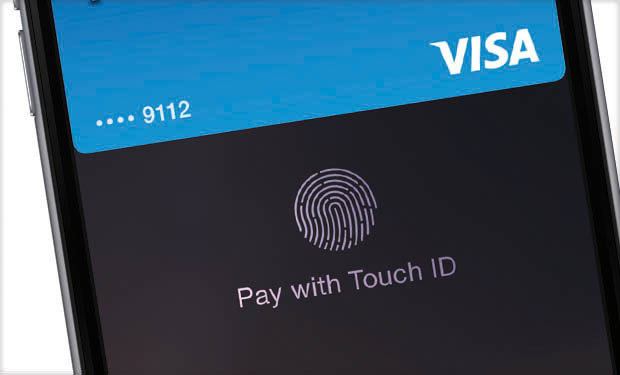 We predict that Apple Pay will lead the way in terms of mindshare and the overall experience. Google Wallet follow in its wake, mopping up Softcard if the latest news (Feb 24th 2015) runs its course. Haters aside, we expect CurrentC to fall apart in its current shabby QR-code form and adopt an easier method of payment that customers will begin to expect. Paypal will be adopted mostly by smaller retailers who can’t fork out the costs of the POS and processing, and those where custom loyalty schemes are intrinsic to their mobile strategy in a way that Apple Pay might negatively affect. One final point to remember is that these are still very early days in mobile payments, and we don’t envision seeing a completely cash-free high street any time soon. Recent polls suggest that in the US, only 2.4% of retailers are currently set up to take NFC mobile payments. A strong path will be carved by the Apple Pay rollout in 2015, where people see how much easier it is and these new consumer behaviours become normalised and expected. We will also see supporting metrics that get heavy coverage in the press beyond the likes of Starbucks. Until then, retailers have a little time to set their mobile strategy in the right direction to take full advantage of the incredibly exciting changes taking place in the mobile payments space. SAP: The Future Of Holiday Retail: Mobile, Beacons, And Wearables, Oh My!